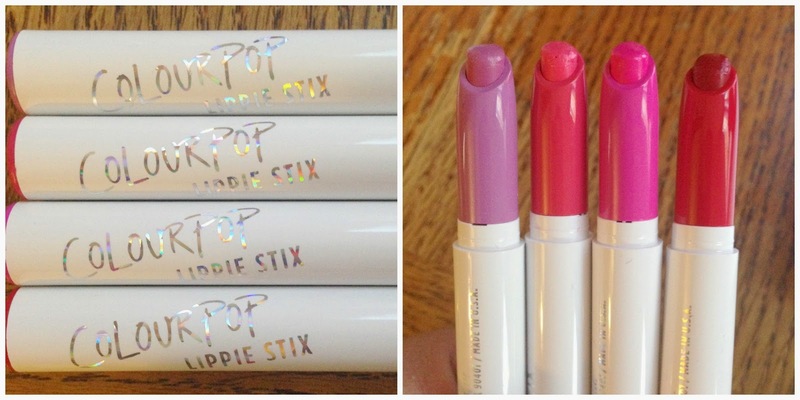 I'll tell you how behind I am on my beauty blogging... ColourPop released a second type of Lippie Stix before I ever blogged about the first type! Ah, I've some ground to cover. So, all their Lippie Stix come in these sturdy plastic cases that are long and slim, and the endcaps as well as the top part of the inside tube matches the lip shade. The bullet is very narrow, but I like how much easier it is to control when I apply. 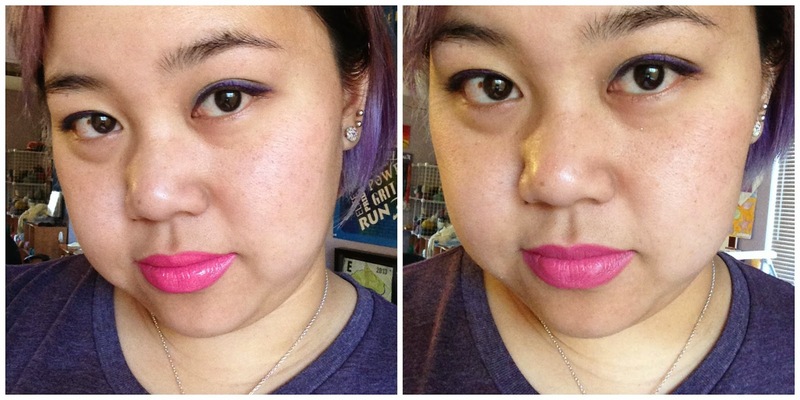 The hyper glossy Lippies are, as you can guess, very glossy and slick, though suuuuuuuper pigmented. I found that I had trouble making them look good straight from the tube, since I would wind up with too much product on my mouth. 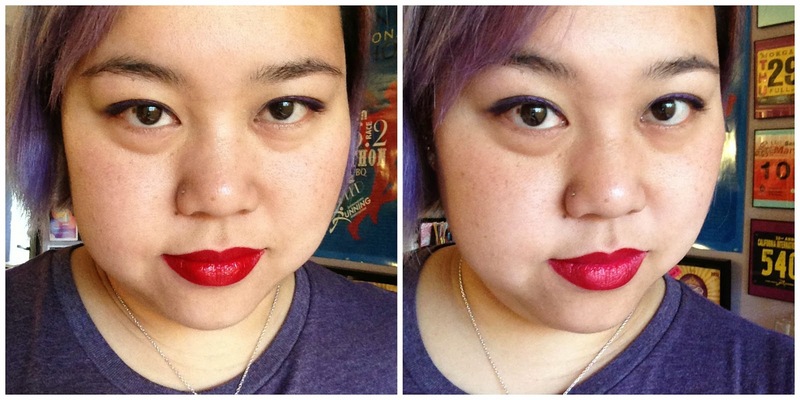 (Which was fine with the basic red, but not so great with the brighter/lighter shades.) I didn't have this issue so much with the mattes, which are obviously drier (not in a bad way). 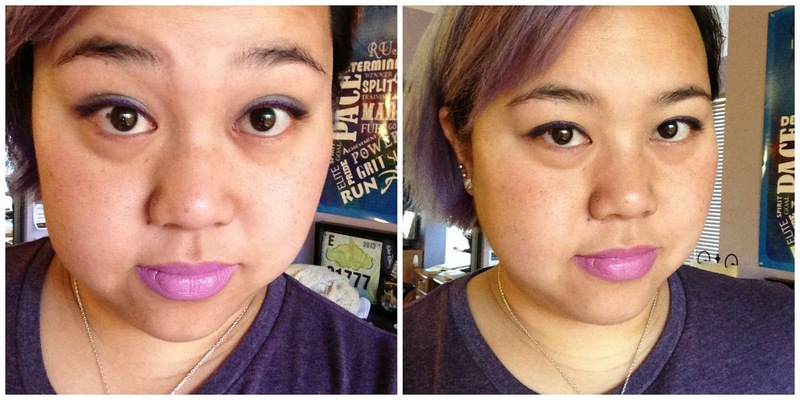 In the photos on the left below, I just applied them how I always apply lipstick (from the tube). In the photos on the right, I blotted them gently. You can see that blotting made them significantly less glossy, but they looked more natural on me. This is Corset, "a true pink lavender lilac." I really like this color, but I needed to blot it to make it look a little less Easter-y. (Or I should apply any one of these with a brush.) Corset is available individually. Juicy is also available individually and is a "bright strawberry pink." I feel like blotting muted it quite a bit, and it's a gorgeous color as-is, but again, in order to make it wearable for me, I needed to tone it down. Confetti is the other hyper glossy Lippie included in the gift set, and it's my favorite for obvious reasons - you just can't beat a good red lipstick :) It looked better and applied better straight from the tube as-is than the other three shades, though obviously it's such a great shade of red ("true blue red") that it doesn't take much to make it look good. (You just can't say the same about neon pink or pale lavender, which don't look good on everyone unaltered.) It also changed the least when I blotted it. So, I like what I'm seeing from the formula so far - the shine and softness of a gloss, but the pigmentation of a lipstick - and I didn't have them on long, but as I progressed through my testing, the stain left behind got progressively brighter and brighter. I'll have to test these for staying power at some point, but I think I can say that I have high hopes in that department. As with (almost) everything on the ColourPop site, Lippie Stix are $5 each, and you get free shipping on orders of $30 or more. I'm pretty sure that's cheaper than the drugstore brand lipsticks these days (or, at least, comparable). ColourPop is very quickly becoming one of my favorite brands, and it's thanks to their low price points and high-quality products. 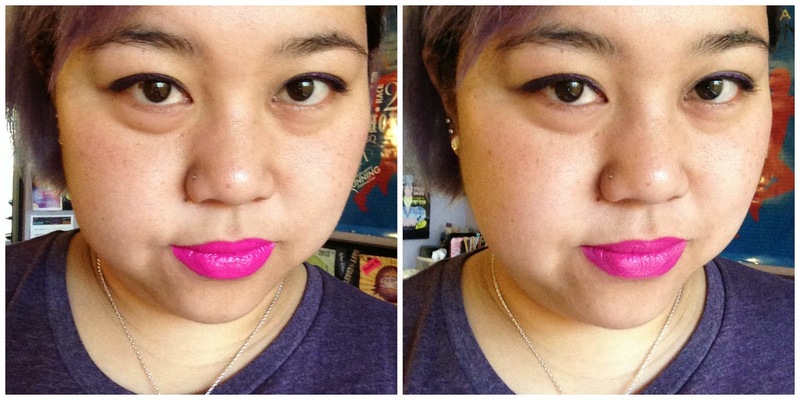 PS - I bought their Lippie Stix primer too, and it's really awesome. It really fills in the fine lines and softens my lips without making them greasy. I think I'm in love. I'm find it especially useful to wear under the mattes, and I will probably stock up on a few tubes of this one now to wear with all my other lipsticks and not just the ColourPop ones.